Many Reunion users are former Family Tree Maker users. They prefer our singular focus on making a great Mac app to organize, store, search, and report their data. The instructions below are for exporting a GEDCOM file from Family Tree Maker version 3 for Mac and importing the GEDCOM file into Reunion. (Similar instructions will apply if you're moving data from FTM for Windows.) We suggest you bookmark this page and refer to it while transferring your data. Open your tree (what we call a "family file") in Family Tree Maker. From the main menu, choose File > Export. The Export window will appear. In the Individuals to export section, select Entire file or Selected individuals, depending on whether or not you want to export everybody or a subset of your tree. 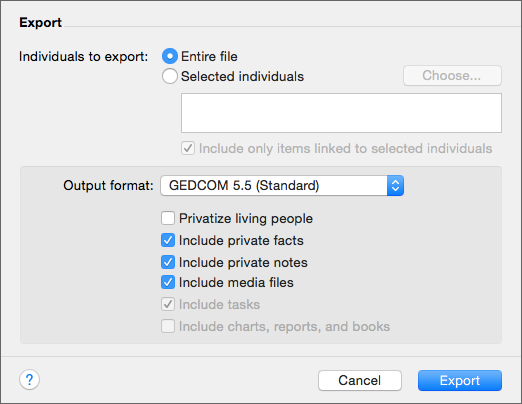 In the Output format section, select GEDCOM 5.5. Click the Export button. Name the GEDCOM file you're exporting and click the Save button. Remember the location specified in the Where menu. A confirmation window will appear in FTM. Click OK.
On your Mac, drag and drop the GEDCOM file onto the Reunion app icon, which is inside your Applications folder. Ancestry.com does not currently provide a way for third-party apps, such as Reunion, to directly interface or "sync" with their online content. Data can only be transferred from their online content to other apps via GEDCOM or manually (transcribing information from the online content via copy-paste). If Ancestry.com eventually creates a way for third-party apps to interface with their content, we would certainly consider that feature. GEDCOM import from Family Tree Maker is generally very good. The basics, such as all the people, names, dates, places, links (parents to children, spouses, etc.) should transfer fine. The trickier areas of GEDCOM are custom fields, sources/citations, and images. See this FAQ for more detail about importing sources and citations. Consult the Reunion User Guide for more detail on images in GEDCOM files: click a ? button, or use the Help menu in Reunion and search for "gedcom images." If you need additional help beyond what is presented here, contact our help email address or visit the ReunionTalk forum where others who've already made the transition can lend a hand. Reunion running in "demo mode" does not import GEDCOM files. Contact us if you'd like a limited-time license to evaluate a GEDCOM import.